In response to your questions, CWA inquired about the status of the day after Thanksgiving. Governor Murphy will not be signing an Executive Order to close the State of NJ this Friday for non-essential employees. We are sharing this information so all members are aware. While it has been 10 years since a Governor has closed on the day after Thanksgiving, we disagree with this decision. We had hoped that members would be able to enjoy time with their families without the use of personal leave time. We have discussed with the Governor’s office, and we expect Departments will soon be notified, that requests for time off will be granted as liberally as possible. Although we have never before had the day after Thanksgiving off as part of our Contract, we will bring this matter up at the bargaining table. However, we continue to believe that the day after Thanksgiving should be a day when the State is closed as a matter of policy and are unwilling to trade any of our existing holidays for this day. We wish you and your family a happy, healthy and safe holiday. This entry was posted in NJ State Workers, Public Sector on November 20, 2018 by cwalocal1037. 1. Retroactive checks for back increments and the August 1, 2017 2% across-the-board increase will be distributed on October 26, 2018. These will be separate paper checks, and because there could be several increments owed and the pension withdrawal was different for each year of the retroactive increases, there will be several checks. In fact, if you had many personnel actions over the three years of retroactive money, including promotions, you could be receiving as many as 3 to 10 separate checks. You will have to review the pay stubs of each check so that you understand what they are for. 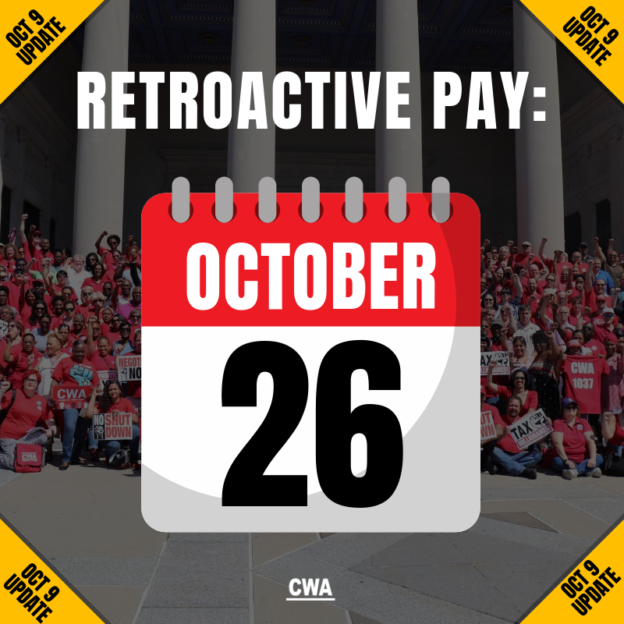 CWA has asked for a spreadsheet of everyone’s retroactive checks. All of the checks will have withholding from them, except that you will not be charged retroactive healthcare deductions. 2. $650 bonuses for people at max have been distributed, however, we are having a dispute with the State about some people who were not provided with these bonuses even though they did not receive increments. CWA has filed a grievance on behalf of everyone who didn’t receive an increment and should have gotten a $650 bonus but didn’t. If you should have received the bonus and didn’t, but you didn’t file a grievance, that is okay– we filed it on your behalf already. 3. When the retroactive checks are received and you have had a chance to review them, we will distribute a process for asking payroll to review any mistakes if you think one has been made. Please do not guess at how to get that addressed. This has been a complicated and difficult process of running the time clock back to get the calculations right we just need to get money in hand and work through each difficulty as it comes up. This entry was posted in NJ State Workers, President's Message, Public Sector on October 9, 2018 by cwalocal1037. CWA, the AFL-CIO, NJEA and our public worker union allies have taken the next step in our fight to save our pension and the retirement security of hundreds of thousands of New Jersey residents. A ballot question during this coming November’s elections would amend the New Jersey Constitution to ensure that our pensions are fully funded. Now we need you to take the next step by joining this fight. 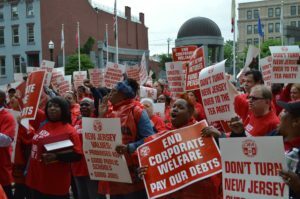 This entry was posted in NJ State Workers, PCBSS, Political Action, Public Sector on February 27, 2016 by cwalocal1037.